Children's Hope International: Have you started your taxes? 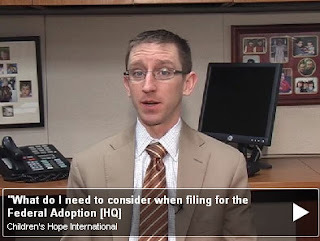 CPA David Smith gives pointers on the Federal Adoption Tax Credit; share yours, too! If I am only now beginning the adoption process, and may not complete the process for 2 years or so, can I count on getting the adoption tax credit? Or might I find 2 years from now that the credit no longer exists? I would absolutely need to receive this credit for adoption to be affordable to me, and can't consider going through this if I may end up not being able to take this tax credit. Whoops - sorry about that! We had no trouble with our taxes this year and they did not ask for any further information!! Thank you, Anonymous, for your question regarding the future of the Federal Adoption Tax Credit. We forwarded your question to David and he had this insight to share with you. Unfortunately, as of right now the credit is set to expire at the end of 2011. While it is certainly possible that this credit can be extended, we are unable to count on that happening until it is actually signed into law. If your adoption hinges on the availability of the Federal Tax credit, I would strongly recommend you look into other and additional funding sources. Here are a few places the resourceful adopting family can look: 1) Check if your employer offers an adoption assistance or reimbursement benefit, if not, ask, 2) Check if you state offers an adoption tax credit, 3) Check with your local church to see if they would be open to providing assistance, and 4) Spread the word to family and friends. This is certainly not an exhaustive list but will hopefully give you a start. @ Troy & Rachel - Thanks for your feedback! Don't forget to call your adoption consultant. You are not alone! Also, please see our Financing Your Adoption page for additional resources to consider in making your adoption financially possible: http://adopt.childrenshope.net/helpful_information/finances/index.php. We finalized the adoption of our daughter from China in 2008. Do we qualify for the federal adoption tax credit and what documents do we need to file with the IRS, if we qualify? "You should amend your 2008 tax return to claim the tax credit. If there is any unused credit, you would then need to amend your 2009 (and 2010) tax returns as appropriate. Use IRS form 8839 to report the expenses when preparing the amended returns." Milena - We strongly recommend you consult a local tax professional to help you in your tax preparations. Thank you!